Looking for that perfect gift! Stand out from the ordinary gifts and presents and give that special someone something they will remember for a long time, the gift of plants and palm trees. 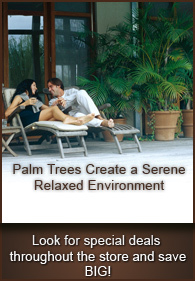 Not only do they create an oasis from the mundane wall or corner but they also clean and purify the air we breathe. Lets all do our part and Green America, planting a palm tree or plant can change lives! 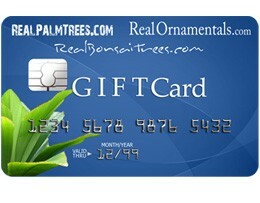 For more information about the gift card please visit Real Palm Trees - Palm Help. Product Detail The Real Palm Trees Gift Certificate can be used throughout any of the three stores: RealBonsaiTrees.com, RealOrnamentals.com, and RealPalmTrees.com. They have no expiration date and can be a fantastic way to show your appreciation for plants and trees, to your loved ones. Birthdays, Weddings, Anniversaries, Holidays and many more occasions are perfect opportunities to give a gift that continues living on and which the recipient will remember forever.